I can already hear it. The many outcries from the Star Wars “faithful” railing against Solo: A Star Wars Story. “That’s not my Han Solo!” and “Who asked for a Solo standalone movie? !” have been plastered over and over on various sites that make any type of article regarding the film and not to mentioned the “Boycotting” of the franchise after the fan base had been torn in two after December’s release of The Last Jedi. While I had my problems with that film, I kept an open mind with Solo as 2016’s Rogue One exceeded my expectations. 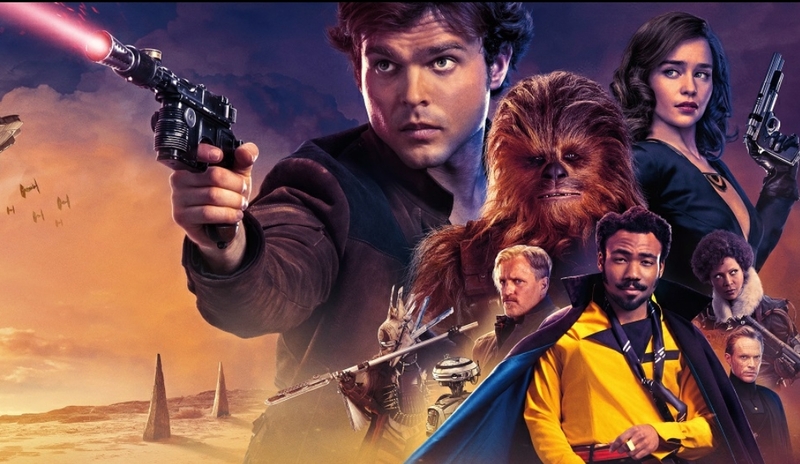 With the many issues Solo had in production and the worrying stories that well over 80 percent of the film had been reshot with substitute (and ultimately fully credited) director Ron Howard, I couldn’t help but feel that maybe this film maybe ended up being a train wreck as many reported. The story follow’s the origin of Han Solo (Alden Ehrenreich) and how his life transitions from committing small time crimes in the name of survival on the planet Corellia to becoming the smuggler and best pilot in the galaxy we all have come to love. We see how he meets Chewbacca (Joonas Suotamo), how he receives his iconic DL-44 blaster, how he wins the Millennium Falcon in the high stakes game of Sabacc from Lando Calrissian…basically, it’s an abridged origin story of Han Solo. It answers questions about Han that maybe you thought of when watching Star Wars, but didn’t bother looking them up through the various means we have now. Ehrenreich was great as Solo. I’m pretty grateful he didn’t do a cheap Harrison Ford impression and made the role his own. I didn’t bother worrying about him taking on Solo with the leaks of his “inability” to act and needing an acting coach as I thought that was blown out of proportion. Donald Glover as Lando was great as well. He matched the charm and charisma Billy Dee Williams brought to the character many years ago while adding a bit of his own flavor to it. Woody Harrelson plays Tobias Beckett, who brings Han into the smuggler’s life. He did well enough, but I couldn’t help but think about the various other character’s Harrelson had played before in other films. It’s not a bad thing. Emilia Clarke plays Qi’ra, the love interest who reunites with Han after he leaves Corellia and joins in on his adventure. She bounces back from her last sci-fi endeavor. I was worried she would only be tied down to her role on TV, but I hope she has more big screen films. Thandie Newton and Jon Favreau play other members of Beckett’s crew. These were smaller roles, but enjoyable none the less. Phoebe Waller-Bridge plays L3, a sassy navigation droid that felt very misplaced in the movie like a forced piece of a puzzle. While these characters are enjoyable on the surface, the really isn’t too much development with them and you don’t connect with them if things go one way or another for them. The villain of Solo lack installing fear into the audience. Paul Bettany as Dryden Vos was generic, but that maybe due to the recasting as Michael K. Williams was to play Dryden, but scheduling conflicts led to the change and were the character’s place in the story. There is a side villain in Enfys Nest that seems very cool and makes their presence known early during the first heist, but a certain reveal with the character takes the wind out of the sails which is a result in rushed and jumbled writing. The clunky third act slows down the movie when you can see certain things come a mile away. There is a reveal that makes up for it big time. No joke, my jaw dropped and my eyeballs almost shoot out of my head. The action is great, there is a scene that shows what Han is up to after leaving Corellia and before meeting Beckett and crew that I hope we get a full fledged movie from or even a series. The various heist that happen throughout the film work well. The CGI is pretty standard Star Wars, which is a high standard in film making. We get to see the famous “Kessel Run”, which was my favorite part of the film. The humor works well for most of the characters involved. From Beckett complaining about his thumbs hurting from firing the Falcon’s cannons or the circumstance how Han and Chewbacca meet and agree to help each other out of a jam. We are going to reach a time that most of these new films and TV shows will lack substance the sagas carry. What makes Solo different from other Star Wars films is not being a story with weight behind it. In the grand scheme of things, the movie is more of a compilation of moments we heard about from previous films. It stands on its own for being its own adventure rather than connect to the original saga or even make a reaching effort to connect to the new trilogy of films or the prequels.